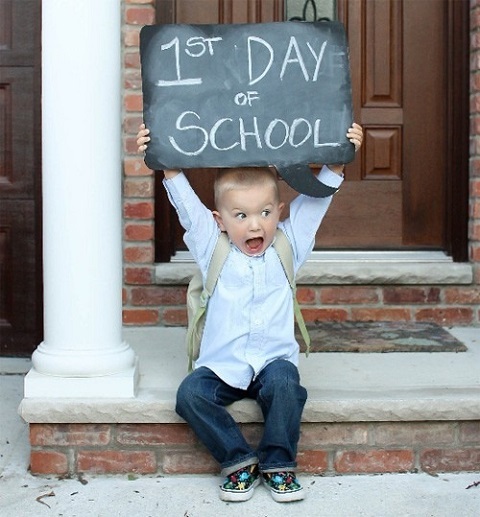 Sending your child off to start their first year of school can certainly be a little daunting. Don’t worry though, most kids will be absolutely fine. Some schools send out Prep Readiness Guidelines, this can be a tad intimidating when you read the list but don’t be too put off by it (check out my website). Just remember that they are going to learn a lot during their first year of school. What can you do as a parent in this last month to help their transition to prep? Firstly make sure they have a reasonable bedtime. They are going to be so tired when prep starts aim for 7pm. As tired kids are more emotional the next day which means they will find it harder to share with their new friends, tired kids can’t concentrate very well so your child will not learn so well the next day either. If they are not great at dressing themselves or you actually help way too much, then start to work on dressing this last month. A teacher cannot help 25 kids in the bathroom or assist to change for swimming. Your child will need to be more independent so the more they can do for themselves the better! Start now with carrying their own bags, lunchboxes, drink bottles. Get them to practice helping with the groceries. Now for lunchboxes, most schools do not tolerate unhealthy food in lunchboxes today, so if your child is particularly fussy then no time like the present to make a change. Out goes the junk food, the high sugar food, in goes the fruit, vegetables, yoghurts and healthy wraps or sandwiches. Make the switch now save the tears and dramas at prep. Can your child share? Hmmm, sharing is one of the hardest things to learn as a child, but it is necessary to be able to play well, get along with a variety of other children. If your child thinks everything is theirs time to let them know it isn’t actually. At home as parents we tend to let our kids get away with things, win all the games, give them what they are asking for to save the tantrum etc but guess what, have you thought that other kids at school will not just give it to them to avoid the tantrum. Then your child will not be able to cope with not winning everytime, not having everything and not owning everything. Best to start at home than at prep. Let’s talk academics: most children have the whole app education sorted where they can match shapes, numbers, sizes etc remember to pay attention to other skills such as holding and using crayons, paints, scissors, glue, writing their name, doing a physical puzzle rather than the drag and drop. Your house is full of items to sort, paint, colour, create, cut out just look around and get inspired. These are all fine motor skills that are desperately needed to be successful in prep and life. Lastly, does your child move? Do you get outside and kick a ball together? Catch a ball. Throw rocks, seeds, pebbles to a spot or a bucket? Jump on the trampoline, climb at the park, balance on a log or garden bed edge, try hoolahooping. Well holidays are here so take your child outside, walk around the block or two, go to the park and look for what you can do physically. There is way more happening in your child’s brain that just learning to catch when you do this.... lots of pathways being formed for reading and writing in the future. Plus you will all feel better too.